Only the bag made it home with me. 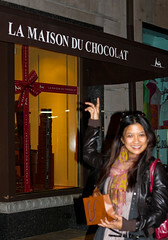 Spotted: starstruck Jersey girl walking down Madison avenue with an empty La Maison du Chocolat bag. That can only mean one thing. You should be proud because I made it three whole blocks before I devoured the bag of haute chocolates. 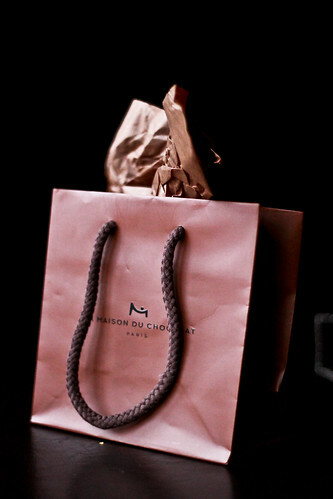 La Maison du Chocolat would be the Tiffany's of the chocolate world, I suppose. There was something so fancy about the upper east side boutique, the atmosphere felt regal enough for a curtsy. 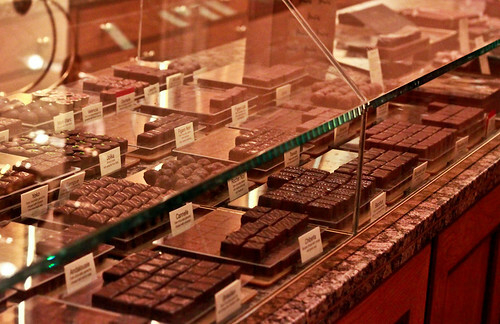 This Parisian chocolatier mastered the art of chocolate making a long time ago. You can tell his chocolates were meant to impress. I spent a good 10 minutes gawking at their glass-enclosed display table where the chocolates were laid out like diamonds. Being a penniless writer with no (lucrative) job, I had no right, absolutely no right, spending $12 on a mix of dark and milk chocolate pralines ($12 buys you six teeny weeny pieces). But I did anyway (eh...life is too short for bad chocolate). My favorite was the dark chocolate Figaro, which was a combination of hazelnuts, almonds and caramel all crushed together. The chocolate shell snapped confidently, and the soft praline center did what it was meant to do—tease with a seduction as silky as cream, hinting at a roasted aftertaste. It was very tiny, no more than an inch long and wide, but it had the perfect proportion so as the nutty filling did not overpower the chocolate that housed it. *Figaro! Figaro, figaro, figaro! * It was the stuff of dreams, that praline. Sweet, sweet, dreams. La Maison du Chocolat, I bow before thee. Please pardon the inexcusably dorky picture. Excellent article! You're brilliant. I want those chocolates too!